The events of the past few months, with moving and my health issues, have been stressful on us all. For Baby Sweetpea, it has been especially hard because she can’t always vocalize how she is feeling, and all the traveling has seriously wrecked havoc on her schedule. That is why getting back on schedule and finding ways to calm her have been so important. That is where creating a new bath and bedtime regime have come into play. The last few months leading up to our move have been downright chaotic. Sweetpea used to have a regular bedtime, and while we didn’t have a strict ritual, it has been in my mind to create one because my other kids thrived on routine when they were little. I wanted to incorporate things she would enjoy while creating a relaxing atmosphere to help her prepare for sleep. 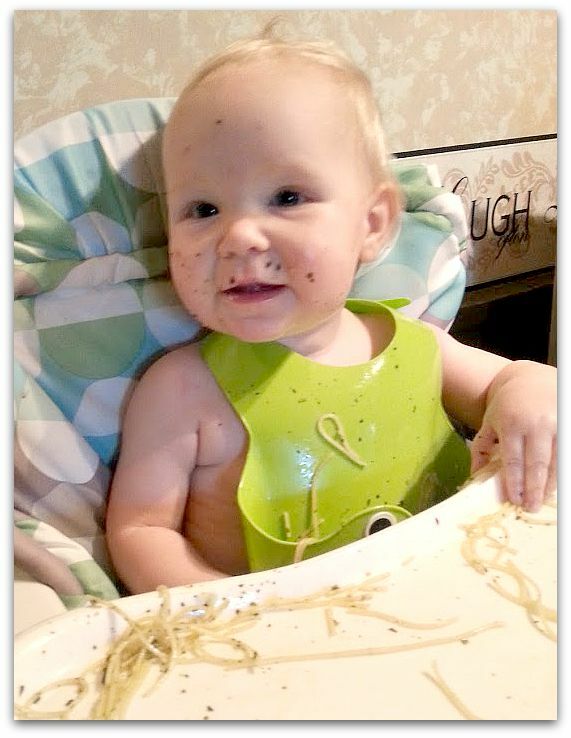 After a dinner like this, I think she definitely needs a bath. 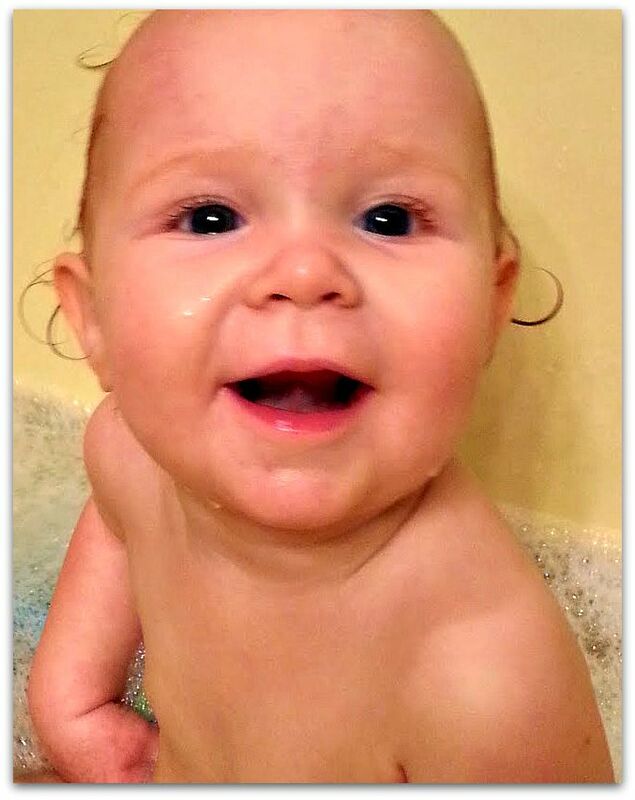 Sweetpea loves bath time, and she loves to play in the tub. Recently, I tried the 3-in-1 Bubble Bath, Shampoo & Wash by Baby Mantra to make bath time more fun. She loved it, and now we do a bubble bath every night! The thing I love about this product is that it is multi-purpose and all natural as well. You can make your child’s bath bubbly and then use the same product to get your child squeaky clean! With having older kids that are dancing and participating in other activities during the week, it’s nice to just be able to grab one thing and make it work for everything. I was a little skeptical that something that you can use as shampoo and body wash would bubble up enough, but Sweetpea thought it was great! After bath time, I have been putting lotion on her because it helps relax her, and it keeps her skin soft. 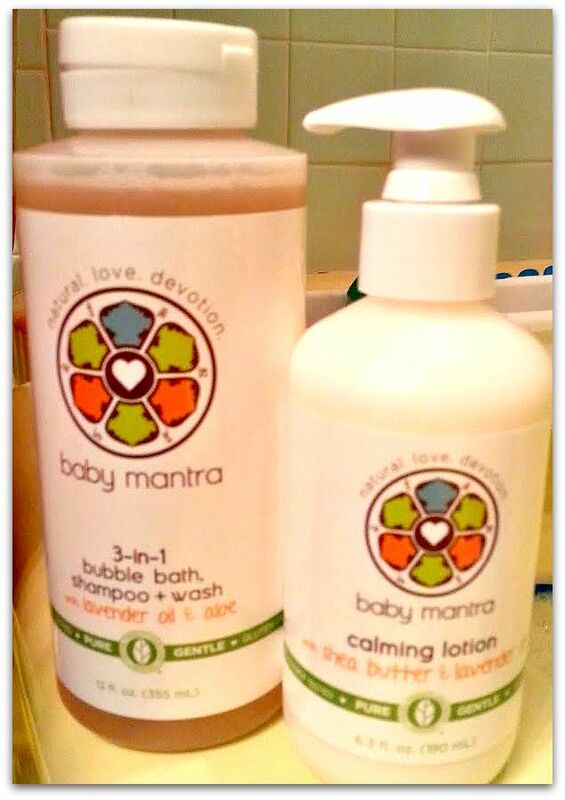 The Baby Mantra Calming Lotion is great because it had Lavender in it, which creates a calming effect. It aids in getting babies and children ready for sleep! I like this particular product because it isn’t as greasy as some other lotions. I tend to lotion her scalp a bit, and it doesn’t make her hair look all oily. She also smells great afterwards, and I know it is probably weird, but I do love to sit, snuggle, and smell my baby now and again. These are must haves for a relaxing bedtime for babies! Sometimes, after a particularly trying day, more than a bath and lotion are needed to calm my baby down. I was so happy to be able to try Baby Mantra’s Calming Massage Oil. Baby Massage is a great way to promote bonding with baby anyways, but it smells so good, and it really does help relax Sweetpea. Moving to a new house has been rough on her, and while she can’t tell me how she is feeling most of the time, her temperament has been cranky much of the time. Soothing her with the natural baby oil has made her more pleasant in the evening so that we can do things like read or sing before she goes to bed. She hasn’t been as fussy when I put her in her bed. a good nighttime line up! 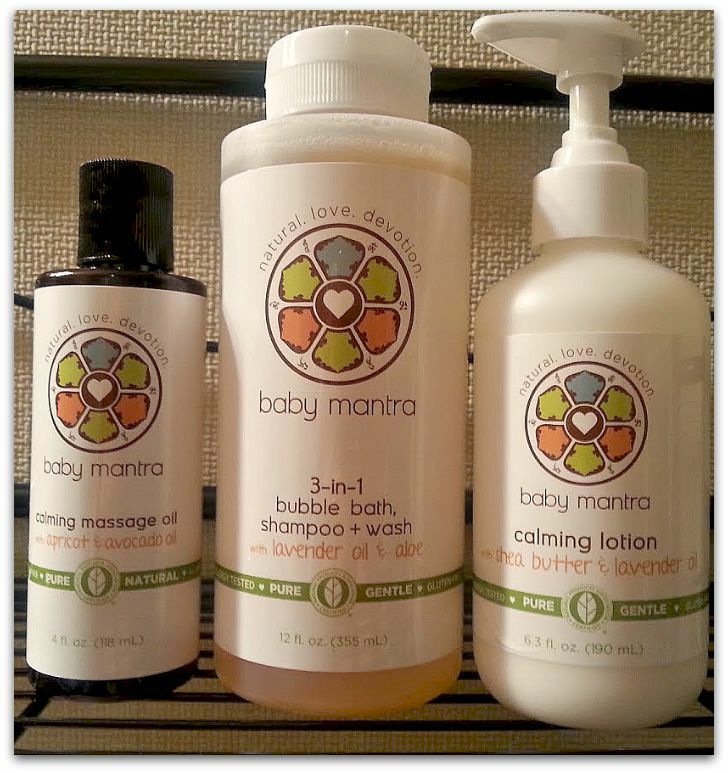 For my kids, I like to use more natural products, and that is what makes Baby Mantra a great fit for my family! 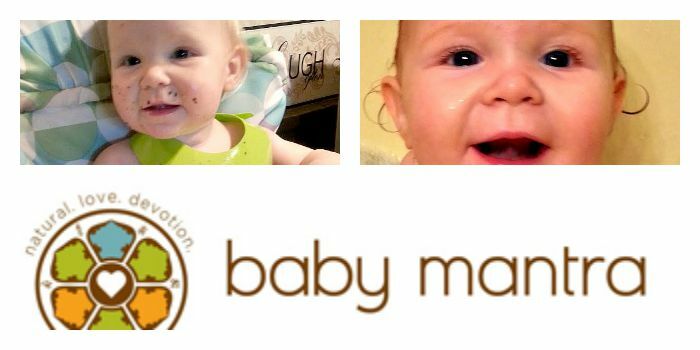 You can find Baby Mantra products across the country at stores like Albertsons, Jewel Osco, Walgreens, Duane Reade and Meijer. We recommend using the store locator on the company’s website to find a store nearest you. In addition, Baby Mantra can be found online on websites such as Amazon.com, Babiesrus.com (and retail stores nationwide), Drugstore.com, Walgreens.com, and Diapers.com. Creating a bedtime ritual with a nightly bath and infant massage has been helpful in getting our baby to adapt to all the changes around her. It is important to give children consistency, and I want to make sure that Sweetpea enjoys our new house, her room, and the world around her. I don’t want her stressed out. It isn’t good for her, and it isn’t good for mama either. A good bedtime routine is good for everyone! We like to pray together! stories, snuggles, and songs. I love bedtime because it’s so relaxing after a fun day! When my children were little rituals were an important part of our day and night to keep the whole family feeling less stressed and generally happier. I wish I had these products when my kids were young, but it will be great to use them with my Grandbabies!